Google Reviews for Allan Cavanagh Caricatures- Click Here! We are delighted that we booked Allan for our Wedding on the 8th of December 2018. Allan has a great personality and is wonderful at what he does. Several of our guests have commented on Allan and their joy at having a caricature done at the wedding, a great momento of the day. I cannot recommend Allan highly enough. Redited- Allan spotted my review on here and contacted me immediately. He had genuinely missed my email. He rectified it straight away and sent out a sketch. He dealt with the situation really well and I think that's a sign of really good customer service.EDITED. Allan was supposed to send us a sketch of ourselves after the wedding because he left before we got back to the hotel. He never did, and didn't respond to emails. Left a bad taste. Original review belowMy husband and I got Allan for our wedding coctail hour in Galway June 2017. Allan was super easy to deal with and very professional. In the run up to a wedding you appreciate straight forward suppliers who respond quickly and Allan did just that. Delighted we went with him. This was my second time requesting a caricature from Allan and once again he did not disappoint! The first was a caricature for my wedding and the second was a request from my dad for a caricature of a friend who had a big birthday coming upAllan is just fantastic and so talented, he manages to capture features and expressions to an absolute tee, the extras he adds to his caricatures like the persons interests, hobbies etc , add that extra personal element to his drawingsOn both occasions the caricatures received over whelming responses 🙂 Allan himself is so professional and friendly, I would not hesitate to recommend him to anyone looking for a caricaturist and I will definitely be ordering from him again in the future! We booked Allan for our wedding at the beginning of October. He travelled quite a distance to be with us and it was a pleasure to have him as part of our day. He really added something special to the day... guests are still talking about how great he was. And deservedly so! He had a constant queue and went above and beyond to make sure that everyone was taken care of. Guests were so thrilled with his caricatures. Allan is a true professional and a wonderful artist. We can’t thank him enough. Allan is a fantastic creative artist who took on board everything we asked for and created a beautiful signing board for our wedding day.I would definitely recommend him to brides and grooms looking for a unique piece of decor for their day, which then becomes a piece of artwork that you can keep forever! We booked Allan for our wedding reception August 2018, and he was fantastic. Really put the guests at ease and there was a queue of people lining up once they saw how good his caricatures were. Highly recommended. The guest board he did for us was brilliant too!! Allan was a pleasure to deal with, a few quick emails and all was sorted. 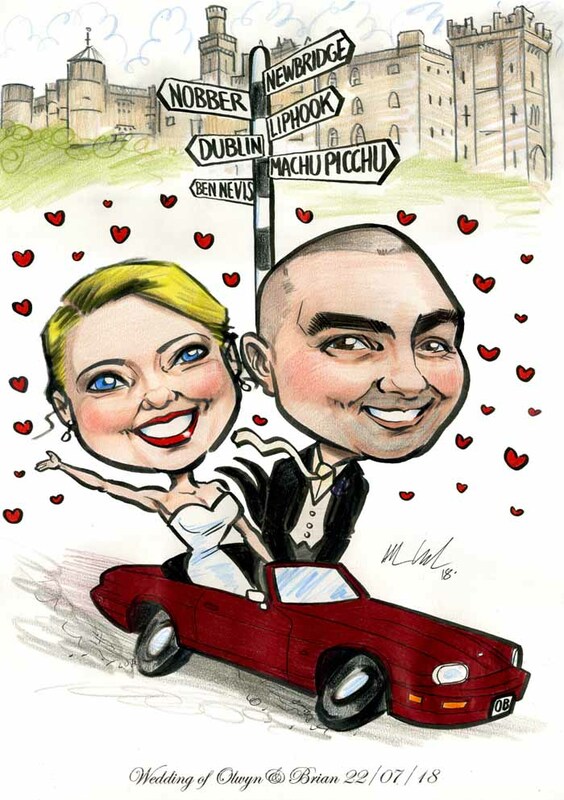 Our wedding guests loved their caricatures and it added a great buzz to our reception. I'd highly recommend Allan for any event, he wont dissapoint. We wanted a unique wedding invitation and contacted Allan with a picture of both of us and a few ideas on what he might include in the caricature. He got back with an amazing caricature of us with the venue we were to be married in on the background. We created a wedding invitation ourselves with this picture and were so impressed with the reaction we got from guests we decided to hire Allan on the Wedding Day too in Cabra Castle in Cavan to do LIVE caricatures. We were delighted with response from our guest s. He even took photos of our guests next to the completed caricatures which we really appreciated seeing afterwards as had been too busy on the day to see them done. We felt also it was a classy form of entertainment that matched our venue perfectly and in our opinion provided a lot more entertainment than the usual selfie machine you see regularly these days. Could not recommend Allan enough!! Allan was a massive hit at our wedding! All the guests loved him! We have seen so many of our guests frame the caricatures he did on the day. It was such a great touch and really made our reception special. We absolutely love our canvas and have hung it up now, it is such a nice way to transport us back to the day and read all the messages from our guests! Thanks for everything Allan, we can't recommend you highly enough! I received the caricature this afternoon, it is fabulous and everybody said it looked great. Thank you and I will highly recommend you and your work. I can't recommend enough. Highly professional, fantastically done and delivery was spot on. This retirement caricature went down a treat and to say we were all delighted with it was an understatement!!! Just received my Caricature from Allan for my fathers retirement. We are absolutely delighted with it. He incorporated everything that we asked in such a humorous way and my father loved it. Allan was so professional and a pleasure to deal with. Would highly recommend him. Allan did an amazing job on the artwork for our wedding invitations. Very professional and lovely to deal with! I would highly recommend! Allan did a superb caricature of my sister and husband on their wedding day. Every detail was perfect and they were really thrilled to receive it. Highly recommend Allah's caricatures, a great wedding present! Couldn’t thank Allan enough. What an amazing talent. He did an amazing Caricature of my daughter Caoimhe’s for her 21st. She was thrilled with it. I booked Allan as a wedding gift for my brother and delighted i did. He was very professional, his work was top notch and he engaged with all the crowd. Eveyone was gathered around him as he did his masterpieces. We all had a great laugh at them afterwards. What made it cool was the end of the page had the wedding couple's weddin date and names are there so a great gift to remember. Allan did a caricature for my partner as a Christmas present. I sent him a few photos and a description of my partners interests and a little bit about his personality. I was worried that without meeting him he would not be unable to capture his personality but there was absolutely no need to worry. The caricature is fantastic and the likeness is brilliant. Allan did a superb job. It will be hard to beat this Christmas present next year. Allan did a caricature picture for my Dads 70th birthday of all the family and grand kids. Picture turned out brilliant and was a great surprise for my Dad who got a real kick out of it. Allan was easy to deal with and came up with an excellent caricature of my Dad the way I described. His imagination is great. Thanks Allan all the best for the future. Couldn't recommend Allan enough. His work is brilliant and truly impressive. We had him at our wedding and the guests loved it. It was something different and everyone enjoyed being able to take their picture home with them. 100% satisfied customer! Our business was looking for a great caricature for one of our colleagues as a farewell present. Allan's style was the one that spoke to us the most and all we did was provide images, information about the person and a short while late....voila!!! A masterpiece which has all of us in stitches and awe at the same time. A huge thanks to Allan for materialising our vision beyond our expectations. Best wishes Allan and THANK YOU!!!! See more reviews by clicking here for my live caricatures for weddings, parties and events, and my gift caricatures for weddings, retirements, anniversaries, promotional gifts and birthday presents! Double Vision by Charlie Adley – Thank Goodness for the Real World Beyond Facebook!